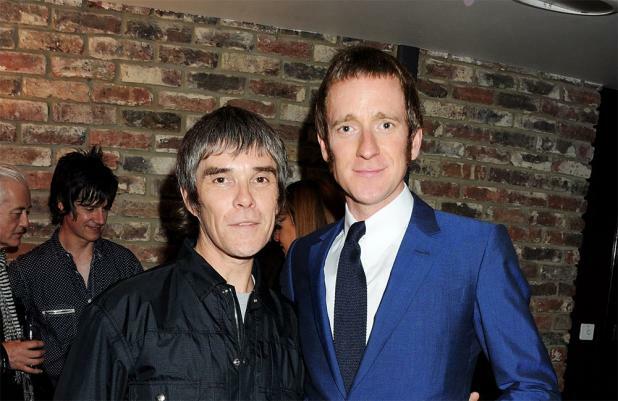 The Stone Roses singer Ian Brown hailed gold medal winning Team GB athletes Bradley Wiggins and Jessica Ennis as the "king and queen" of England at an intimate London concert last night (06.08.12). The reformed Manchester band performed an exclusive show hosted by adidas Underground to celebrate the Olympics in a front of star-studded audience which included the heroic duo, other athletes and numerous stars. Before the band played 'Something's Burning', Ian said: "We've got the queen of England Jessica Ennis and the king of England Bradley Wiggins here. And our musical heroes, you don't know who that is right?" Other guests included rower Pete Reed, Led Zeppelin guitarist Jimmy Page, Paul Weller, Primal Scream frontman Bobby Gillespie, Boy George, 'Harry Potter' star Rupert Grint and Daisy Lowe. The band - also comprised of bassist Gary 'Mani' Mounfield, guitarist John Squire and drummer Alan 'Reni' Wren - took to the stage just before midnight at the east London venue which is located just miles from the Olympic Park. As the four-piece walked on, Ian joked: "Sorry we're late, we were having a shoot out backstage." The group then played a phenomenal greatest hits set which included 'I Wanna be Adored', 'Waterfall', 'Fools Gold', 'Love Spreads' and 'This Is One'. They closed the gig with a rousing rendition of 'I Am the Resurrection' as athletes, celebrities and competition winning fans all danced wildly.